The prospective EU-US trade deal TTIP (Transatlantic Trade and Investment Partnership) could be the world's biggest such treaty. While there are disagreements and divergences, in many areas of the negotiations the European Commission is singing from the corporate hymn-sheet. The revolving door between the public and private sectors is helping to grease the wheels of the TTIP corporate lobby. Some of the EU's most senior decision-makers and officials, alongside those from the member state levels, spin through the revolving door into corporate advisor roles; others go in the other direction, from corporate jobs into the public sector. These revolving door cases cover some of the biggest EU corporate lobby sectors, including telecoms and IT issues; food and agriculture; finance; investor-state dispute settlement; pharmaceuticals; regulatory cooperation; and others. This phenomenon creates great potential for conflicts of interest, and demonstrates the synergies between business interests and the European Commission, the UK government, and others when it comes to TTIP and trade negotiations. Karl De Gucht Trade Commissioner Board of Belgacom? TTIP, the Transatlantic Trade and Investment Partnership, is one of the biggest games in town right now. As negotiations between the European Union and the United States enter their tenth round of talks in July 2015, TTIP is slated to become the biggest trade deal in the world. It is a major policy priority for the European Commission which claims that the deal will create jobs and boost economic growth. Europe’s biggest businesses have come out united in strong support for TTIP. Yet many politicians, economists, and civil society groups, including Corporate Europe Observatory, are rather more cynical about the supposed benefits of TTIP. Increased competition could harm Europe’s weaker economies and small and medium enterprises, and cause job losses. Meanwhile, the harmonisation of EU and US laws could drive down existing standards on both sides of the Atlantic, undermining consumer protection, sustainable agriculture, environmental protection, and labour rights. It is clear that there is a huge lobby battle under-way in Brussels, and indeed in Washington DC too, about what should and should not be included in TTIP and negotiated upon, a battle which CEO has recently documented. Once again, corporate interests' contacts with the European Commission's DG Trade massively outweigh those of NGOs, trade unions, and others representing public interests (DG Trade is mandated by the European Parliament to negotiate this deal on behalf of the European Commission); and our data also identifies which corporate sectors are undertaking the most lobbying. While there are disagreements and divergences, in many areas of the negotiations DG Trade is singing from the corporate hymn-sheet. 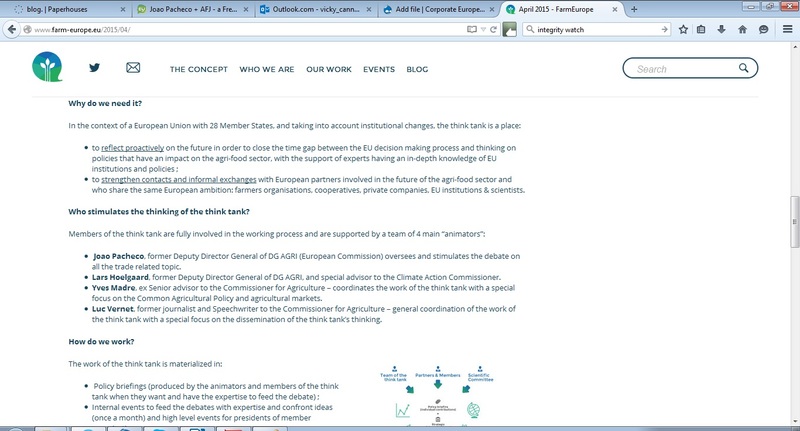 Of course, this is not a new phenomenon; CEO's website documents the capture of EU decision-making by big business interests across numerous issues, from finance to fracking. CEO examines how such corporate capture works in practice, and the revolving door, whereby public officials move to work for the private sector, and vice versa, has a significant part to play. Whether it is through the recruitment of seasoned commissioners, officials, or MEPs who take their insider know-how and contact books with them; or moves by individuals to join the EU institutions from corporate interest backgrounds, the revolving door spins easily in Brussels, including in the area of trade and TTIP. In some cases, the risk of a possible conflict of interest is all too apparent. This report documents a variety of revolving door cases with links to trade and TTIP at the EU but also the member state level. The fact that so many can cross smoothly from the public to private sectors or vice versa, indicates the shared interests and ideologies that can exist. The cases cover a variety of lobby issues including telecoms and IT issues; food and agriculture; finance; investor-state dispute settlement; pharmaceuticals; regulatory cooperation; and others. They raise questions about the effectiveness of revolving door rules (and the way in which they are applied and interpreted) in preventing the risk of conflicts of interest from occurring; we also highlight countries and institutions where revolving door rules are entirely absent. It has not been possible to conduct a full review of revolving door cases because of the lack of transparency surrounding this legitimate area of public interest: in general it is very difficult to track when officials leave a public institution and take up a new job. The lack of openness by public authorities in terms of who they meet and the information they publicly release on lobby contacts also hampers investigations to map the revolving door and specific lobbying on TTIP. As a minimum, this report demonstrates the synergies between business interests and the European Commission, the UK government and others when it comes to TTIP and trade negotiations. Whether the revolving door is a cause or an outcome of these synergies is not so easy to determine. But the synergies are there and we believe the revolving door exacerbates the corporate capture of TTIP negotiations. Of course, the revolving door is not a new issue in the US, the other negotiating side of the proposed trans-Atlantic trade deal, nor is it new in relation to TTIP. In 2014 Stanford McCoy moved from being assistant US Trade Representative for Intellectual Property and Innovation to working for the Motion Picture Association Europe as Senior Vice President and Regional Policy Director. Shaun Donnelly, formerly a US trade official, is now a lobbyist for the US Council for International Business. Matthew Jaffe, a former corporate trade lawyer, is now providing legal advice to the US Trade Representative's office. Meanwhile The Intercept reports that Christopher Wilson, the US Deputy Chief of Mission to the World Trade Organisation, until recently worked for lobbyists C&M International; and Robert Holleyman, the deputy US Trade Representative, previously worked as the President of the Business Software Alliance. To cap it all off, the US Ambassador to the EU, Anthony Luzzatto Gardner has had a long corporate career, most recently working as Executive Director of Bank of America in London and as a Managing Director at Palamon Capital Partners. These and more eyebrow-raising revolving door cases appear to be commonplace in the US. So what does the TTIP revolving door picture look like in the EU? 1. Karel De Gucht, from EU trade commissioner to Belgacom board member? Karel De Gucht was the Commission's head honcho on trade, the EU Trade Commissioner, until the end of the Barroso II Commission in October 2014. De Gucht launched the EU-US trade talks and was seen as an especially controversial Commission figure, considering his push for the inclusion of ISDS (investor-state dispute settlement) provisions in TTIP, despite a huge public outcry. Now, and as profiled on RevolvingDoorWatch, De Gucht has Commission authorisation to join the management board of Belgacom (as well as taking other finance industry roles and academic positions). Belgacom (also operating as Proximus and Skynet) is the biggest telecoms operator in Belgium and over 53 per cent of its shares are owned by the Belgian state. Belgacom is a member of the lobby group European Telecommunications Network Operators' Association (ETNO). ETNO and Skynet lobbied EU trade officials on TTIP in meetings behind closed doors when De Gucht was European Trade Commissioner. Skynet was present when DG Trade met with industry representatives to assess their interest in the intellectual property rights chapter of TTIP in April 2013 and in a meeting in July 2013, Commission officials briefed ETNO on the first TTIP negotiation round and promised to “further analyse and discuss internally” ETNO’s position “to identify if new elements should be brought into the negotiations”. The telecoms/ IT sector is the third biggest lobbyist, after the agribusiness/ food sector and cross-sector business groups lobbying on TTIP in the two years to February 2014, meaning it had the third largest number of behind-closed-doors meeting with DG Trade. In CEO's view, and especially considering the overlapping interests of Belgacom, its lobbying friends and DG Trade, the Commission should not have authorised the appointment of De Gucht to Belgacom. Instead, it gave the green light, as long as he “refrained from lobbying the Commission and / or its departments for eighteen months after leaving the Commission on behalf of Belgacom, and that he protected collective responsibility and confidentiality in respect of matters covered by the Commission during his two terms of office”. At the time of writing (1 July 2015), De Gucht has not yet been officially appointed to the board of Belgacom/ Proximus. See De Gucht's RevolvingDoorWatch profile. As the spokesman for former EU Trade Commissioner De Gucht for four years until November 2014, John Clancy put up an aggressive defence of TTIP and other trade negotiations. Yet since De Gucht moved on, Clancy has also departed, joining lobby firm FTI Consulting to specialise in “political communications… bringing extensive experience of issues related to trade, industry and foreign affairs”. Clancy, according to his personal twitter account, remains active on a range of issues including TTIP. According to the EU lobby register (viewed 1 July 2015), in 2014 FTI had lobby costs of €1,750,000-€1,999,999 and a lobby turnover of more than one million euros. FTI's lobby clients are listed as including fracking company Cuadrilla, Google, Facebook, pharma company Novartis, oil services firm Halliburton, and many others. Trade is included in the list of issues that FTI covers for its lobby clients, although in common with other lobby consultancies, it fails to mention the specific dossiers, like TTIP, that it might be working on. However, CEO has seen an email sent by an FTI Consulting team member to an MEP which lobbies on TTIP on behalf of its client, the International Federation of Inspection Agencies. The EU lobby transparency register provides a very limited snapshot of lobbying in Brussels. It is voluntary, meaning that those lobbyists who wish to avoid registration can do so. Moreover, too much of the data provided is out-of-date, inaccurate, or misleading. Some organisations under-report their spending on lobbying, in an effort to appear smaller than they really are; others exaggerate their lobby spend, or simply do not follow the rules. For many organisations whose primary function is lobbying, their total budget figure might be a better indicator of overall lobby spend than the declared lobby expenditure figure. Additionally, many lobby register entries are imprecise and lack important information about the topics lobbied on, while too many law firms and lobby consultancies do not disclose the names of their clients as the rules require. And the voluntary nature of the register means that the joint Commission and Parliament authority charged with administering it, is fairly toothless when it comes to sanctioning lobbyists who don't follow the rules. Clancy himself told CEO in May 2015: “Since joining FTI Consulting, I have not worked on TTIP on behalf of any clients of FTI Consulting nor had any contact with the European Commission on TTIP.” This would appear to be in line with the Commission's authorisation of his move to FTI which came with the restrictions that “after leaving the service, Mr Clancy will not engage in any direct or indirect lobbying or advocacy activities related to DG TRADE's activities and he will refrain from any professional contacts with DG TRADE staff and the Cabinet of the Commissioner for TRADE.” Yet these restrictions are only in place for six months; other 12 month restrictions placed on him relate to “recent high-profile trade defence investigations” that he was previously involved with. In CEO's view, six month restrictions like this are totally inadequate and ex-Commission staffers should be banned from moving to the EU lobby industry so soon after leaving office. Now she is the Director of Trade Policy at the European Federation of Pharmaceutical Industries and Associations (EFPIA) in Brussels, one of the pharmaceutical industry's major lobby groups. 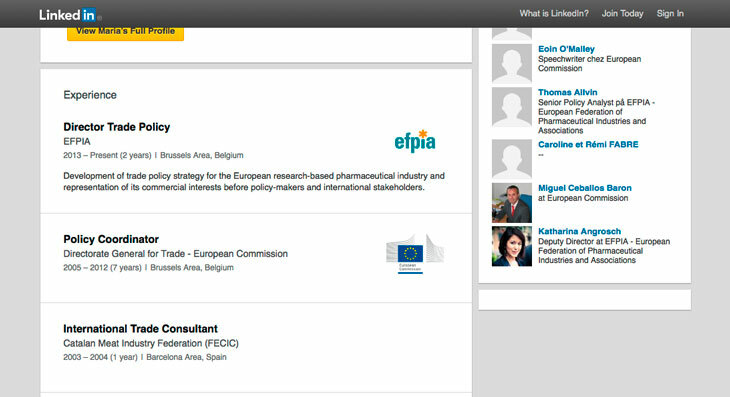 According to Linked-in she is now responsible for the “development of trade policy strategy for the European research-based pharmaceutical industry and representation of its commercial interests before policy-makers and international stakeholders”. EFPIA is very active on TTIP, producing numerous briefings extolling the treaty's virtues for the pharmaceutical industry and patients. In February 2015, EFPIA organised a lunch briefing for parliamentary advisors and assistants aimed at “shedding light on widespread misconceptions about the relevance of TTIP to Europe, industry interests, investment protection and regulatory cooperation”. Trallero herself has written about the need to understand the benefits and to dispel the myths about TTIP. Representing EFPIA, she spoke at DG Trade's TTIP event in February 2014, and again in March 2014 where she presented 'TTIP – an opportunity to strengthen the transtlantic pharmaceutical market', and again in July 2014 on the theme of 'TTIP - Fostering innovation and regulatory convergence for the transatlantic pharmaceutical sector'. 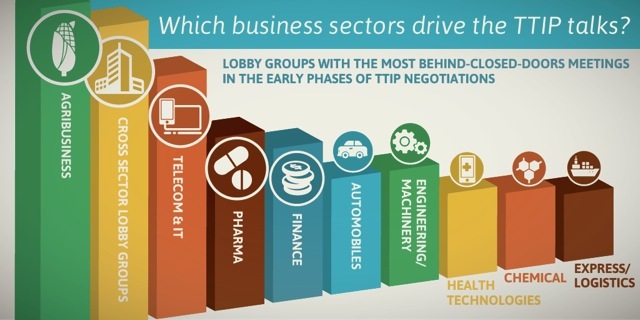 EFPIA has been the fifth most prolific lobbyist of DG Trade on TTIP. Between January 2012 and February 2014, CEO research shows that EFPIA had at least 11 meetings on TTIP, with at least ten meetings occuring between April 2013 to November 2014. The anonymised reports of these meetings do not reveal who attended from the industry side. Additional contact came in the form of emails and information exchanges between EFPIA and DG Trade, including with the EU's Chief Negotiator Ignacio Garcia Bercero. In February 2015 alone EFPIA met twice with DG Trade, including with members of the Trade Commissioner's cabinet to discuss TTIP. EFPIA appears to have significantly upgraded its EU lobby spending in the past year. According to LobbyFacts, for the year 2013 it reported lobby spending of €551,820; for 2014, the EU lobby register figure has increased nine-fold to €5,071,000, making EFPIA one of Brussels' bigger lobby players (viewed 1 July 2015). While EFPIA works on a range of dossiers as well as TTIP, its massive increase in lobby spending matches CEO's wider finding for Big Pharma and TTIP lobbying. No sector has stepped up its lobbying for TTIP more than Big Pharma which has quadrupled its related spend in recent years. While only 2.4 per cent of the corporate lobbying around TTIP came from Big Pharma in the preparatory phase of the negotiations (January 2012 to March 2013), the sector’s share of lobby encounters with DG Trade jumped to 16.5 per cent of the total in the period after (April 2013 to February 2014). EFPIA's lobbying makes its agenda for TTIP clear. Along with its sister organisation in the US, it is asking for a pharmaceutical annex to TTIP, to mirror that in trade agreements with Korea. What this means is industry is keen to create a new channel of influence with regulators on both side of the Atlantic which could discuss medicines regulation and pricing; the risk of this could be that it would undermine existing evidence-based approaches to pricing. Big Pharma also have demands in other areas, including on intellectual property rights, which could delay the sale of lower-cost generic medicines. Surprisingly, the Commission authorised Trallero's move to become a Director of EFPIA in 2013 without applying any restrictions. CEO contacted Trallero via EFPIA but she was away (on maternity leave). Tobias McKenney worked at the Commission for five years until March 2012 as a Policy Advisor in the Copyright Unit of DG Internal market; since June 2012 he has been European Intellectual Property Manager at Google. He is one of six registered European Parliament lobbyists for Google according to the EU lobby register (viewed 1 July 2015). Most MEPs are not transparent about the lobbyists that they meet but we do know that McKenney met with Amelia Andersdotter MEP and Emma McClarkin MEP in 2013. An assistant of an MEP who is close to Google's issues says its lobbying operations are “low-key, open lobbying indirectly through business coalitions rather than openly as Google… They are also pretty clever on establishing personal relations through events like 'MEPs can test the new Google Glass', or 'Google@6', in informal evening event for EP assistants with free beers, snacks, table-soccer, Guitar Hero and other fun things. They did the latter once a month a while ago... Hard to say how successful this all is, of course, but at the very least if helps them to be heard [sic]”. It seems clear that Google is investing heavily in lobbying influence in Brussels. In 2014, Google declared €3,500,000-€3,749,000 on EU lobbying, up substantially from its €1,250,000-€1,500,000 lobby expenditure in 2013 as recorded on LobbyFacts. This is perhaps not surprising; Google has several pressing issues with the European Commission including internet searches, licensing for its Android operating system, and the proposed EU Data Protection regulation. The increased lobby spend may well be paying off. Google ranks only second behind BusinessEurope in terms of the lobbying organisation with the best access to the elite levels of the Commission, according to Integritywatch.eu (viewed 1 July 2015). And while Google's EU lobby register entry does not specifically list TTIP as a dossier it is working on, it is clear that Google is actively lobbying the Commission on TTIP. According to CEO's data, Google had at least one meeting with DG Trade on TTIP in 2012-13, while Trade Commissioner Cecilia Malmström and her cabinet member Jon Nyman had a meeting with David Drummond (Google's Chief Legal Officer) which included the subject of TTIP, at Davos in January 2015. According to the meeting notes, “Mr Drummond offered Google's support on TTIP, both as regards contacts with the US Government and other stakeholders. He enquired about progress in EU's negotiations with eg Vietnam and China in opening up data flows.” It seems that Malmström actively encouraged Google to “reassure” MEPs about the TTIP negotiations, perhaps via organising an event. The meeting notes report that: “As regards the TTIP, the negotiations on data had not really started yet given post-NSA [US National Security Agency] concerns, and it would be good if Google and others could reassure stakeholders, eg through a seminar in the EP”. DG Trade's top official Director-General Jean-Luc Demarty has also met with Google on TTIP via a wider meeting with the lobby group AMISA in February 2014 which brought together various industry representatives. The information in the released document has been redacted, including who specifically attended to represent Google, but it is clear that the issue of intellectual property rights and enforcement under TTIP was raised. Google has also had at least one lobby meeting with DG Trade. All in all, Integritywatch.eu shows that Google had at least 26 meetings with Cabinet members and commissioners from December 2014 to June 2015 (viewed 1 July 2015). It is not clear to what extent McKenney works on TTIP issues for Google; he did not reply to the questions we put to him. Importantly, he also did not reply to questions about his departure from the Commission. The Commission told CEO in September 2014 that it has no record of any authorisation request from Tobias McKenney to join Google. Commission Secretary General Catherine Day has further told CEO that, “The Commission is currently looking into the matter in order to ascertain whether the rules have been fully complied with in this particular case. This procedure is still ongoing and we are therefore unable to provide any further comments at this point in time.” That was in November 2014; no further information about this case has been received by CEO since then. Update 20 July 2015: The Commission has now contacted CEO to say: "the procedure related to Mr Tobias McKenney regarding Article 16 of the Staff Relations has been closed without follow-up. It was found that the person concerned had taken the appropriate steps to inform his service of his intentions to engage in the activity in question, and no objections were raised. " Another former EU official was investigated by the Commission over compliance with the revolving doors rule. Joao Pacheco used to be Deputy Director-General at DG Agriculture before he left a few years ago, when he set up his own consultancy and started to partner with another. CEO raised this problematic revolving door case with the Commission in January 2014; finally in April 2015 we were told that it had taken "the appropriate measure" regarding the former official. Joao Pacheco was Deputy Director-General at DG Agriculture for over two and half years and was responsible for the management of the Common Agriculture Policy. In 2013 the debate on TTIP was just beginning to hot up. He took part in a seminar on TTIP and agriculture issues. The Commission authorised the creation of this consultancy but told Pacheco that he would require prior authorisation on each new consultancy project in the field of agriculture. According to the Commission, no subsequent requests for authorisations for specific projects have been made by Pacheco. At the time of writing (1 July 2015), JSP is not listed in the EU's lobby register and there is no list of clients on the firm's website, though as it states above, it does claim to offer its agribusiness clients expertise in trade and EU agricultural policies. In October 2013, it appeared that Pacheco had additionally become Director of European Markets at Allen F Johnson & Associates (AFJ), a US-based business and policy consultancy operating with a Brussels' office. This firm is no stranger to the revolving door phenomenon: Allen F Johnson served as the US Chief Agricultural Negotiator at the office of the US trade representative from 2001-05. 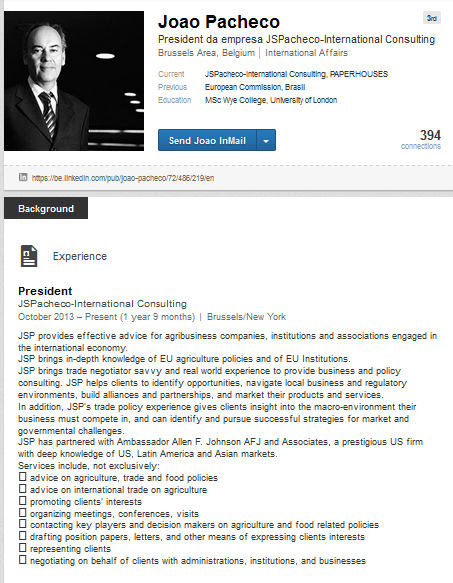 Yet Pacheco's own Linked-in profile, at least until 22 May 2014, also said that he was “Director for European Markets” at AFJ. This has now been amended to say “JSP has partnered with Ambassador Allen F. Johnson AFJ and Associates”. What difference this makes to the Commission's authorisation of this role and presumed decision that no possible conflicts of interest exist is really not clear. The Commission tells us that "There was no evidence that Mr Pacheco had breached the restrictions imposed by the Commission", yet it also says that "By decision of 5 December 2014, the Appointing Authority (ie the Vice-President for the Budget and Human Resources) took the appropriate measure regarding Mr Pacheco, which for data protection reasons cannot be disclosed." In CEO's view, the Commission's lack of transparency, hiding behind data privacy arguments, makes its decision-making totally untransparent and unaccountable. In July 2015, CEO submitted a complaint to the Commission's Secretary General about the handling of this revolving doors case. As for AFJ and JSP, according to their websites, they continue to share an identical office address: Level 4, 227 Rue de la Loi, Brussels which, handily, is very close to the Commission's HQ. They also share the same phone number. And now Pacheco appears to have joined a new initiative, Farm Europe, formally launched on 29 April 2015 in Brussels, which describes itself as “a multicultural think tank that aims to stimulate thinking on rural economies” and “a new forum to connect people interested in a pro-European project for food and agriculture”. It seeks to: “strengthen contacts and informal exchanges with European partners involved in the future of the agri-food sector and who share the same European ambition: farmers organisations, cooperatives, private companies, EU institutions & scientists”. The Farm Europe team, according to its website, comprises various former Commission insiders: Pacheco; Lars Hoelgaard (former Deputy Director General in DG Agriculture and former Special Advisor to the Commissioner for climate action); and Yves Madre (a former Senior Advisor to the Commissioner for agriculture and rural development during the last CAP reform). The Commission appears to have not received any request for authorisation for Pacheco's work at Farm Europe; recently, the Farm Europe website was changed to include the phrase: “Joao is a prominent partner and contributor to Farm Europe”. 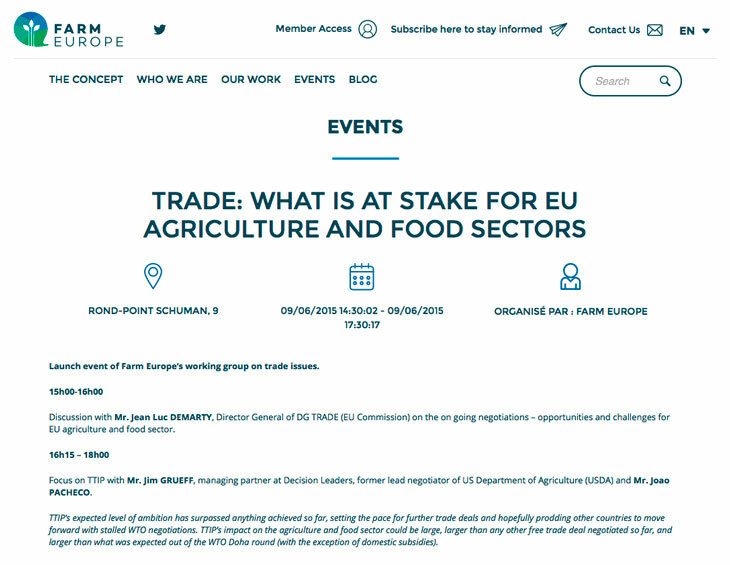 Farm Europe has already had two lobby meetings with DG Trade which included discussions on trade and on matters relating to TTIP. The first was between Yves Madre and an undisclosed official; the second was between Madre and DG Trade's director-general Jean-Luc Demarty. Farm Europe's launch event was addressed by Joost Korte, Deputy Director-General of DG Agriculture. Farm Europe is registered with the EU lobby transparency register. It discloses that four people carry out lobbying activities on its behalf, equivalent to two and a half full-time staff. It does not disclose any funding sources, nor any membership list. Pacheco has not replied to any of CEO's attempts to contact him. It is not just Commission officials exiting via the revolving door to the corporate sector who are greasing the wheels of TTIP; some incoming officials spin through the revolving doors to work on TTIP too. Jan Eric Frydman is a partner in the Swedish law firm Ekenberg & Andersson, where he leads the transatlantic practice. In March, he was appointed Special Adviser for Trade Policy and Transatlantic Affairs to EU Trade Commissioner Cecilia Malmström, a position that grants him extraordinary access to the TTIP negotiations. Frydman holds both of these positions simultaneously, raising serious concerns that the risk of conflict of interests has not been fully assessed. Frydman's professional career has been split between law and business, private and public positions. In 1989 Frydman started practising business law at Mannheimer Swartling where he worked with “international transactions and mergers and acquisitions”. Years after Frydman had moved on, Mannheimer Swartling controversially represented Swedish energy giant Vattenfall in an investor-state legal challenge against Germany for its divestment in nuclear energy. Investor-state dispute settlement mechanisms (ISDS) are one of the most controversial aspects of the TTIP negotiations. In 1996, Frydman made his first spin through the revolving door taking on the position of legal adviser at the European Commission where he was Principal Administrator for relations with the US and Canada (1999-2002), Deputy and Acting Head of Unit for International Affairs (2002-2011) and Head of Unit for International Regulatory Affairs (2011-2012) at DG Enterprise and Industry. The TABD (now renamed TABC – Transatlantic Business Council) links business leaders of more than 70 multinationals from both sides of the Atlantic with US cabinet secretaries and European commissioners. TABC's main aim is to reduce barriers to inter-Atlantic trade and for the past 20 years it has been targeting domestic regulations on each side of the Atlantic as “the new obstacles to trade”. TTIP negotiations are to a large extent about regulations, both current and future. The regulatory cooperation chapter being negotiated as part of the trade agreement aims to reduce differences in EU and US regulations and is likely to significantly change the way regulations will be decided in the future. Frydman has a clear interest in the topic as evident in an opinion piece published prior to his appointment as special adviser. Intellectual property rules are another controversial issue in the TTIP negotiations; Frydman's law firm has an “intellectual property practice” (covering patents, trade secrets and other intellectual property rights). The law firm has posted a footnote to say: “Update: In March, 2015, our partner Jan E. Frydman was appointed Special Adviser to the European Commissioner for Trade. In this role he is bound by rules on confidentiality and impartiality in accordance with European Union rules governing Special Advisers and he therefore does not offer expertise covered by such rules.” CEO is not clear whether this was added before or after after an article was published by CEO which criticised Frydman's appointment. In CEO's view, the Commission's response to our concerns is highly unsatisfactory. The lack of a comprehensive paper trail strengthens CEO's suspicion that the Commission did not undertake an adequate, proactive, and critical assessment of possible conflicts of interest in this case. CEO considers that there is an inherent conflict of interests between Frydman's position as Head of Ekenberg & Andersson's “EU and transatlantic practice” and his role as Special Adviser for Trade Policy and Transatlantic Affairs. Both Frydman himself and the Secretary-General refer to the rules governing special advisers and to Frydman's declaration of honour as enough protection against possible conflicts of interest. In our opinion, this is unconvincing as the rules are ambiguous and unclear and do not specify which activities are off-limits. 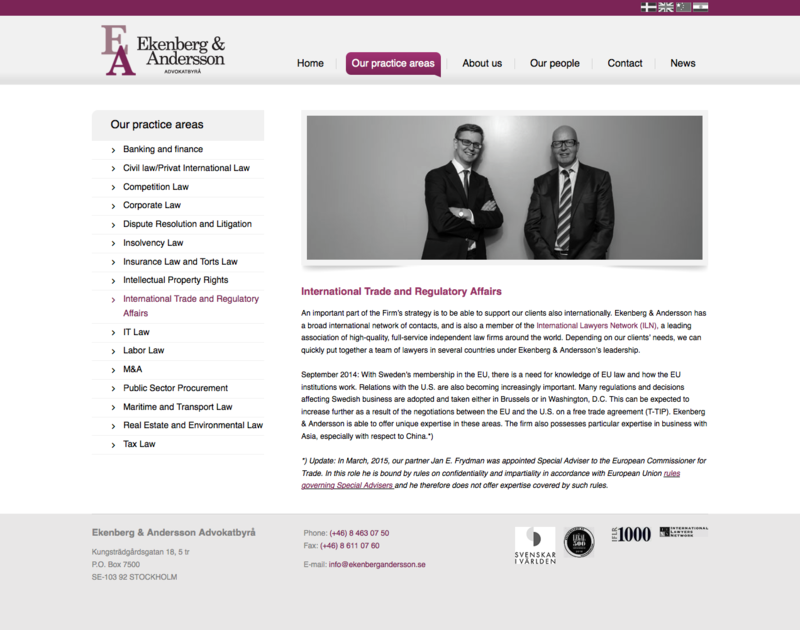 Even if Frydman had removed himself from a wide range of clearly defined areas of work within Ekenberg & Andersson, his role as partner at Ekenberg & Andersson would still give rise to potential conflicts of interest, as his advice could be biased towards the wider financial interests of this company. The Commission should be more thorough when appointing special advisers and it should put far stronger safeguards in place to prevent possible conflicts of interests. Eoin O'Malley, who used to be a Senior Adviser on International Relations at BusinessEurope, the umbrella group for corporate interests, is now a policy officer and speech writer at DG Trade. O'Malley initially joined DG SANCO in June 2010 to work on consumer safety from BusinessEurope, and later moved to DG Trade in February 2012 where he works as a speech-writer and as part of the trade strategy team at DG Trade. The Commission has refused to release any speeches or policy documents worked upon by O'Malley. In March 2015, O'Malley was advertised as the “policy officer in charge of SMEs” at an event called: The impact of TTIP in Malta: Benefits a nd challenges organised by the Malta Chamber of Commerce and the Employers' Group of the European Economic and Social Committee. The latter's twitter account reported on O'Malley's speech saying: “Eoin O'Malley, DG Trade: #EC needs business input & participation in debate. People need to know what economic benefits are. #TTIP #Malta”. For the four years to June 2010, O'Malley worked at BusinessEurope as a Senior Adviser on International Relations. BusinessEurope is one of Brussels' biggest and most influential lobby groups; it registers 23 European Parliament access pass holders and lobby expenditure of €4,000,000 - €4,249,999 for 2014 according to the EU's transparency register (viewed 1 July 2015). BusinessEurope has substantial interests in the work of DG Trade, including in TTIP. In fact BusinessEurope has been the most prolific EU lobbyist on DG Trade with regards to TTIP, according to data produced by CEO covering the period January 2012 to February 2014. In these two years, it had 15 meetings with DG Trade officials, attended civil society dialogues and submitted formal letters and position papers. As well as work on specific sectors, BusinessEurope has been at the forefront of promoting the 'regulatory cooperation' agenda which would give business a pivotal role in preparations for new regulation.